Little Sea Big Fish: Aloha to my first week! Aloha to my first week! What an amazing first week I have had in paradise! I'm sorry I have been hobo and haven't posted anything about this beautiful island yet though. S/O to my amazing sis Mikell Gordon for getting this page started up for me! I can't wait to share all of my adventures I have here with all of you! I left super snowy Bountiful on December 30th, 2012 and headed out for the biggest adventure of my life. I flew to Phoenix and then an hour later headed for Honolulu. Both of my flights were COMPLETLEY full so it was sooo packed. The person next to me on the flight to Honolulu had the genius idea of wearing a huge fur coat on the plane.. which was CONSTANTLY rubbing on me! I swear I about lost it. I usually sleep super well on flights but I probably got about 30 minutes of some shut eye. When we started making the descent for Honolulu, my heart was pounding! We got out of the clouds and I saw my new home for the first time. I tried so hard to hold back my tears. I could not believe that I was actually going to live in a place full of so much beauty. I stepped outside the airport and legitimately thought I was going to DIE! The heat and the 95% humidity was something I definitely was NOT used to! A family that I got hooked up with picked me up at the airport and took me to campus. 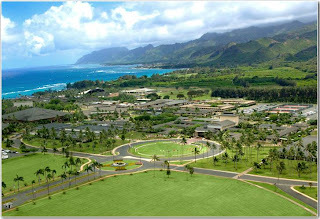 Laie, the town I live in, is about 45 minutes from Honolulu and literally has nothing in it! If I want to go shopping or hit up Wal-Mart or a big store like that, I have to hitch a ride and drive 45 minutes! 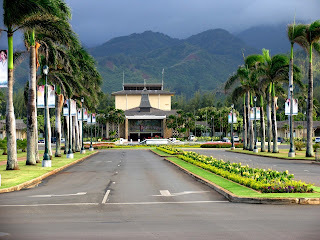 I got to campus and the first thing I saw that literally blew me away was the Laie Hawai'i Temple. I am SO lucky to live so close to such an amazing place! The fountains, palm trees, exotic flowers, and green grounds makes the temple even more beautiful. Luckily, my campus is only a couple minutes away from the temple! We turned down the street and I saw my campus and I couldn't believe how beautiful it was. 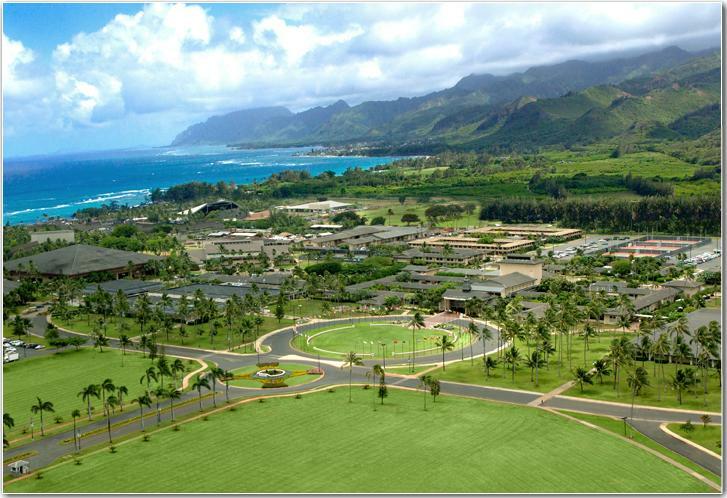 Hundreds of palm trees, groomed gardens, the large green mountains, and so many flags surrounding the school representing the incredible melting pot of students we have at our campus. I got to my dorm and was kind of disappointed about how small it was, but I wasn't expecting anything outstanding! I was SOOO relieved when I came into my dorm and saw New Moon poster on my roommates wall and a zombie magnet hanging on her desk. Instantly I knew we were going to get along just fine! I found her on facebook and she told me that she wasn't going to be here until the 4th since she was home for Christmas vacation. Which I was pretty bummed about. After I brought my suitcases into my dorm, I went to my RA and asked if I could get the boxes I had sent over to my dorm a week prior. Inside those boxes I had all of my bedding, towels, most of my clothes, ect. She informed me that I wouldn't be able to get that stuff until Monday or Tuesday and I was PISSED. I knew there had to be ONE person that could help me get my FREAKING stuff! But nope! My bed consisted of a hoodie for my pillow, a beach towel I had luckily packed in my suitcase, and a beach cover up for my blanket. It was a LOOOONG night.. The next morning I woke up to blue sunny skies! I was so excited because I knew that meant BEACH DAY!!! I got all of my stuff ready for the beach and hurried to the dining center to eat. Just my luck... I get in there and they tell me that my meal plan doesn't start until January. So there I was with NO food and NONE of my stuff from home and I just lost it. It couldn't get any worse! I had to walk about a mile to the closet grocery store and had to buy a bunch of food to get me through the week which WASN'T cheap. After I got some food I hurried to the beach because I knew being in the water would make everything better. My inner mermaid came out and as soon as I saw the ocean I dropped everything and dove right in. The salt water in my mouth and eyes was seriously the best. It had been so long since I had been in the ocean and I forgot how much I loved it. I stayed at the beach for about 6 hours that day snorkeling, laying on the beach, and taking in all of the beauty around me. The other night we had a game night for all of the new students. Everyone was super awkward and weird and me not being shy in any way went around the room introducing myself and finding out where everyone was from. I was seriously shocked! Out of the 50+ students that were there.. I only talked with one boy that I was from America! Everyone else was from Fiji, Samoa, Tonga, Poland, Germany, China, Japan, Indonesia, Korea, Kenya, Brazil, Philippines, ect! I am pretty sure I played every person there in Just Dance. It was so interesting because none of them had heard the songs or the game. Later that night, I was asked to join the dance club after everyone saw my moves on Just Dance... HAHAH! Im not THAT good guys. It was such a blast though. I am so lucky to be at such an amazing place where I am able to learn so much from people that are from every corner of the earth. For the first time in my life, I am now the minority! Today we had a campus tour and I met the 3 funniest girls from Texas and Arizona. (Finally some people from America!) We were inseparable throughout the tour and ended up hanging out all morning. We had quite the adventure today at the beach in the rain! When we were walking back to campus, we were walking down a residential street and we heard clicking on the ground... we turned around to see a bunch of dogs running right towards us. We all started screaming and jumping on each other as the dogs came up and started jumping up at us. We tried running but one dog would take you down to the ground. We were all laughing to the point where we couldn't breathe. We had to temporarily tie the dogs up to the fence so that we could get a head start of them. We BOOKED it back to campus and we were almost there when we turned around and saw the herd of dogs running towards us again. We were all screaming and ran into the Aloha Center where we sat there and laughed about how we legit about got eaten by wild dogs. Tonight, we are going to a pizza Pa"ina and then headed to the Polynesian Cultural Center. So Stoked! I am so happy I have finally found some girls I love hanging out with! Its going to be quite the adventure with them! Sorry for such a long post.. thanks so much to all of you for all of your good luck wishes to me. I love and miss you all so much! your life is amazeballs. i need to visit you with your sister. Nat I'm so happy you figured out how to do a post with pictures. You did an awesome job I'm excited to read more!! YAAY!